Have you ever encountered a bubble gum that was so yummy you wanted to swallow it whole? 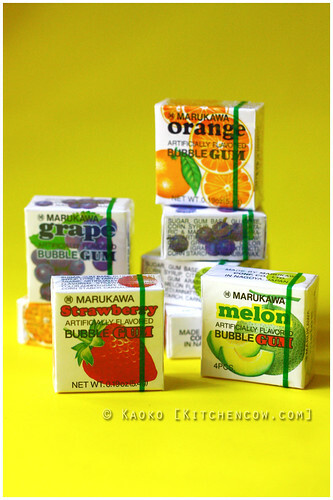 Growing up in the 80s, Marukawa was that gum for me. Not that I knew the brand. I just remember buying small boxes of four fruit-flavored gumballs and refusing to share. I give up chewing before the gum does. It was a fond memory from early grade school, which until recently, was just that–a memory. As we were waiting to pay for our purchases at K-mart during our recent Guam vacation, I spotted a familiar box lining the counters. It was THE bubblegum! I remembered it as a gumball by Lotte, but there was no mistaking the packaging. 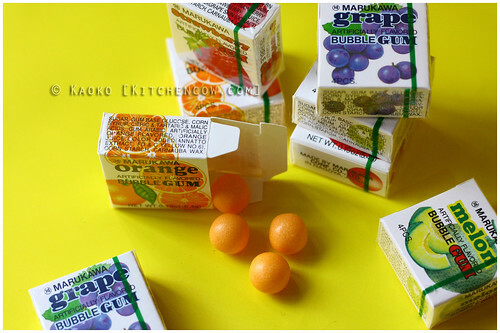 These colorful candies, labeled Marukawa, was the one from my childhood. I happily grabbed a pack containing 8 boxes. There were there familiar strawberry, orange and grape flavors, plus a variant that was unfamiliar to me—melon. Cracking open a pack, I was greeted by the same small gumballs. Pastel colored with a soft almost pearly sheen, it looks quite elegant—probably not a description you’d usually give gumballs. As a kid, Marukawa felt so premium with its classy looking boxes. I quickly popped all four pieces in my mouth. This is exactly the same gum I remembered. Sweet and fruity with a soft resilience. It didn’t toughen after repeated chews. It remained cottony soft and wonderfully chewy. Afterwards, I regretted not buying more but now that I have been reminded of it, I’ll definitely try looking for it locally. It’s amazing how a small thing can bring back so much in terms of memories. What candies do you miss for YOUR childhood? Grape and Strawberry were my favorites. That musk melon is definitely interesting…. i loved these!!! grape is my favorite! !